This involves Wikipedia's Title Blacklist System for Salted pages. 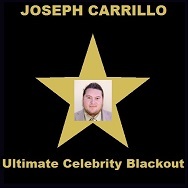 Ultimate Celebrity Blackout Star Joseph Carrillo was recently blocked by Wikipedia the not so free encyclopedia. 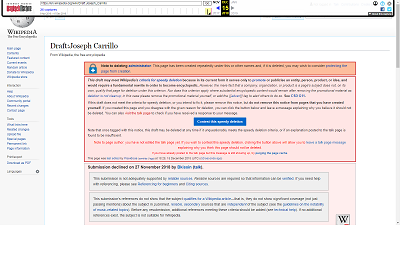 The page originated as a Draft from the star's website http://www.josephwcarrillo.com then was later rejected by Wikipedia for lack of independent third party sources. This is possibly the largest blacklist wikipedia has ever used on a Celebrity. In the meantime the celeb's website http://www.josephwcarrillo.com is currently linked to EverybodyWiki, a more celebrity friendly version of Wikipedia http://en.everybodywiki.com/Joseph_Carrillo. Wikimedia Staff responsible for the Ultimate Celebrity Blacklist include Bkissin, Robert McClenon, Onel5969, Stefan2, Praxidicae, Bradv, and Spencer. You can view the chat page below.